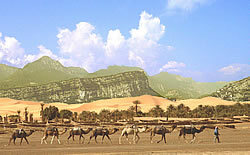 If you love silence and wide open spaces we will lead you on foot and on the back of dromedaries or camels on the most beautiful dunes of Garda Desert. 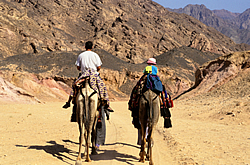 Far away from the motorways and the traffic, from urban conglomerates, you will then continue the excursion by camel. 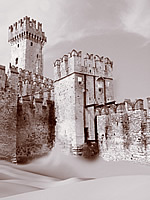 You will visit the fantastic peak of Sirmione, the fort and towers, as well as Malcesine (municipality in the province of Verona), and you will take a rest at the Colà oasis. The day’s outing takes place in daylight and in the evening you will discover thousands of stars…. 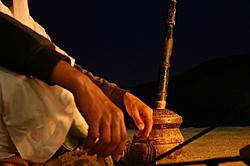 A pleasurable walk on the back of a camel or a dromedary will allow you to see a marvellous sun-set and will leave you with a permanent pleasant memory: the pasty flavour of tea with peach juice sipped according to tradition in a Benàco-Bedouin encampment. daily or weekly excursions to a vast choice of panoramic and naturalistic itineraries from distances of 10 to 100 Kilometres, personalised according to your wishes. 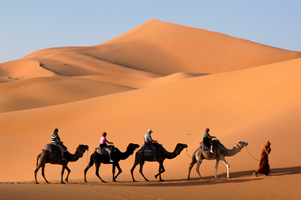 We have both camels and dromedaries available for trips.